This is a new pilot project partially funded by the Quebec Centre for Biodiversity Science. Insects are the most diverse group of eukaryotic life on earth, yet a lot of biodiversity research and most biodiversity assessments ignore them completely (mostly because they are too diverse for researchers to handle). There are standardized ways of trapping and sampling insect diversity, with pitfall, pan, and Malaise traps being the most frequently used. Each method has its own inherent bias, for example pitfall traps tend to collect arachnids and beetles and Malaise traps tend to collect flies, wasps, and other flying insects (but rarely beetles). Suction traps were developed for monitoring crop virus vectors, especially aphids. 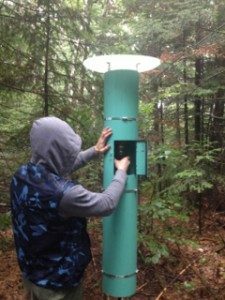 We installed a transect of suction traps in the heart of the Laurentian forest at the University of Montreal’s Biological Research Station. 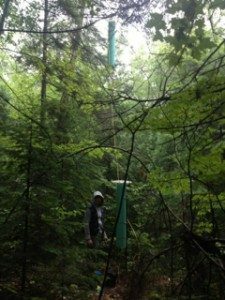 Our traps sample at 2m above the forest floor and are placed 50m apart; at one site we placed a second trap 7m up in the canopy. The aim is to document the heterogeneity of insect diversity across relatively small spatial scales. 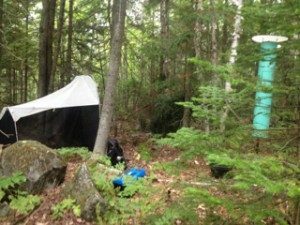 At each of four suction trap sites, we also placed a Malaise trap. Whereas Malaise traps tend to catch larger insects capable of flying longer distances, the suction traps catch much smaller insectes that do not disperse as far. We expect that the contents of the Malaise traps will be more homogeneous across sites that those of the suction traps. Rather than preparing and identifying the tens of thousands of trapped insects, we will be using meta-barcoding methods to quantify and compare the genetic diversity of our insect samples. Along with being a study on the heterogeneity of insect diversity, given our poor knowledge of the smallest insects, this is also a project of species discovery. Traps sampling at 2m and 7m above the forest floor. Replacing suction trap collecting jars. At the same time as we’re trapping insects, we’re also recording the soundscapes at the four sites. That is, we have digital instruments recording the biophony, geophony, and anthrophony at all times. We aim to develop acoustic complexity and/or entropy indices that will correlate with the insect biodiversity.